While watching the sun set, Sally once enjoyed a bottle of 1989 Chateau Clinet, and she was impressed by its complexity and beauty. I first became interested in wine when studying abroad in France during college. 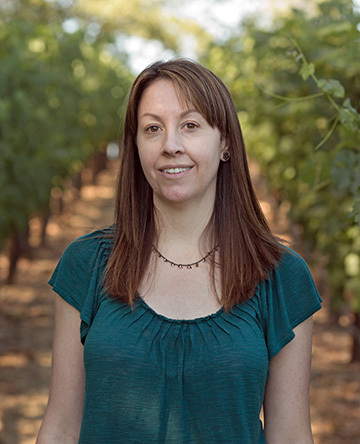 After finishing my dual degree in Biology and French Literature at the University of Michigan, I got a Master’s Degree in Enology at UC Davis. A bottle of 1989 Chateau Clinet, sipped with friends watching the sun set over Sky Vineyards on the top of Mount Veeder. It was the first wine I had ever tasted that was so complex and beautiful, and a wonder to return to as it opened up in the glass over several hours. Bob Foley (owner, Robert Foley Vineyards) is the person who gave me the confidence to make picking decisions solely based on flavor; Romel Rivera (associate winemaker, Pride) has a photographic memory for the details and stories that have gone into each bottle of wine; and Elizabeth Vianna (winemaker/GM, Chimney Rock) has been a great friend ever since our Davis days. I really enjoy every step of the process, from the quiet time spent blending in the caves in the winter, to walking the vineyards throughout the growing season, to the meditative monotony of working on the bottling line and the excitement of harvest. Sustainability extends to the employees, including our vineyard team, many of whom have worked at Pride for nearly 20 years. The Pride family closes down the winery for two days each year so that we can all do community service together as a team. We are unique in that our property is situated right on the Napa/Sonoma county line, along the ridgeline of Spring Mountain. I’ve heard some great county line stories, including an old schoolhouse that was built on skids to slide into whichever county had better funding. It takes patience and time to develop the skills that make a great winemaker. Being a winemaker sounds really glamorous, but most people probably don’t realize that there is also a huge amount of physical labor involved. Jeans and work boots outnumber dresses and heels at least three to one!